Oakland University’s e-Cornucopia: Teaching with Technology is an annual one-day technology conference that explores online teaching and learning topics including pedagogy best practices, software, apps, engagement techniques and much more. 2017 marks the 9th consecutive year Oakland University has provided this regional forum for networking and the exchange of ideas. This conference is intended for higher education faculty, instructional designers, instructional technologists, academic administrators, graduate students and anyone who in interested in incorporating technology into their courses. New this year! We are introducing the Technology Test Kitchen, which is an area where conference attendees will be able to have hands on experiences with different hardware and software. We will have different ‘Master Chefs’ guiding the experience and sharing how they use the technology but it is meant to be experimental and free form, a kind of maker space for educational technologies! Classrooms often experience the tension been a teacher’s expectation of students and a student’s expectation of the teacher. How can we identify, communicate, and reinforce these expectations to prevent tense student-to-student and student-to-faculty interactions? As a result of this session, participants will be able to differentiate learning and behavioral expectations in the 21st-century university classroom, compare expectations for online and traditional learning environments, and communicate expectations through multiple tools offered in the learning management system (LMS). There is an interaction between the learning environments along with how faculty interact with one another. There are a variety of expectations on the student side and faculty perspective. Best practices for communicating expections include: 1) before the first day, 2) on the first day, 3) first week, and + 4) throughout the semester as reminders. Piazza wiki was recommended as a way to create a persistent FAQ for a course. 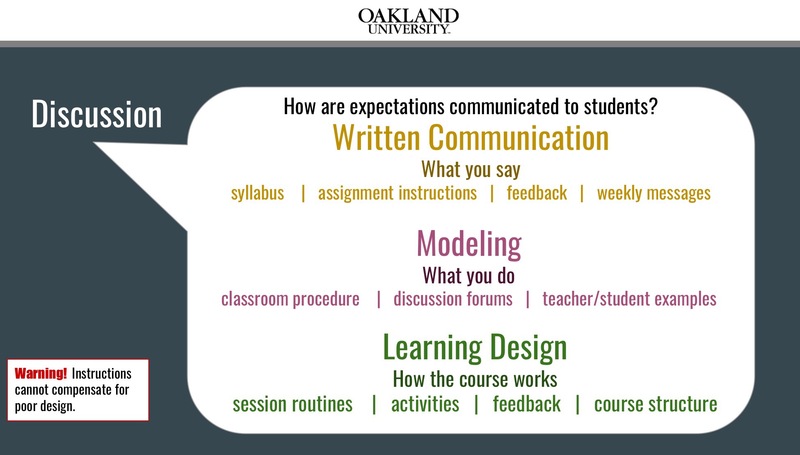 Course Design for First Week is Important – Recommendations include setting up expectations via orientation > syllabus (syllabus quiz), beginning of the semester todo checklist, sharing requirements for communications/disccussion board frequency and use/office hours/appointments, ensuring delivering where to go for help (class “citizenship” behaviors), time commitment, additional resources such as LMS help, Dropbox, Open Document, etc. 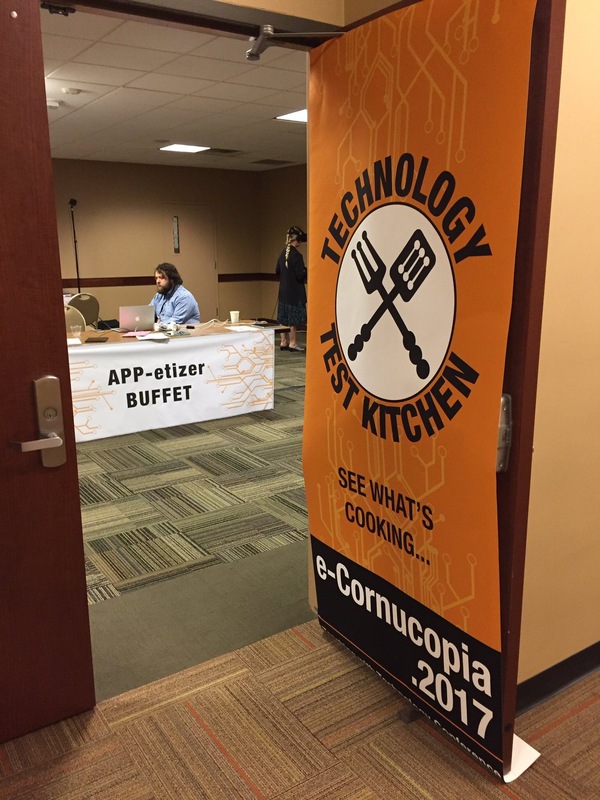 Apps in the test kitchen included: Evernote (note taking), Slack (group messaging), mindmeister (mind mapping), educreations (interactive whiteboard), photomath (scan to solve problems), animoto (in class games), Kahoot (in class quizzes and games), and duolingo (language learning). Scaffolding learning presents opportunities to increase student engagement with the subject matter and introduces alternate learning strategies. Scaffolding technology into a well-designed instructional strategy not only serves to engage students, but also to provide students with practice in honing their own higher order thinking skills. This presentation introduces several teaching strategies in which scaffolding technology becomes a critical component in the learning process. Greg Allar – Gregory Allar is a Special Lecturer in the International Studies Program at Oakland University. He is also a Research Associate at the Center for Russian, East European and Eurasian Studies at the University of Michigan in Ann Arbor. Peer Evaluation via Google Doc – Providing students with the ability to easily collaborate on writing documents and sharing feedback. 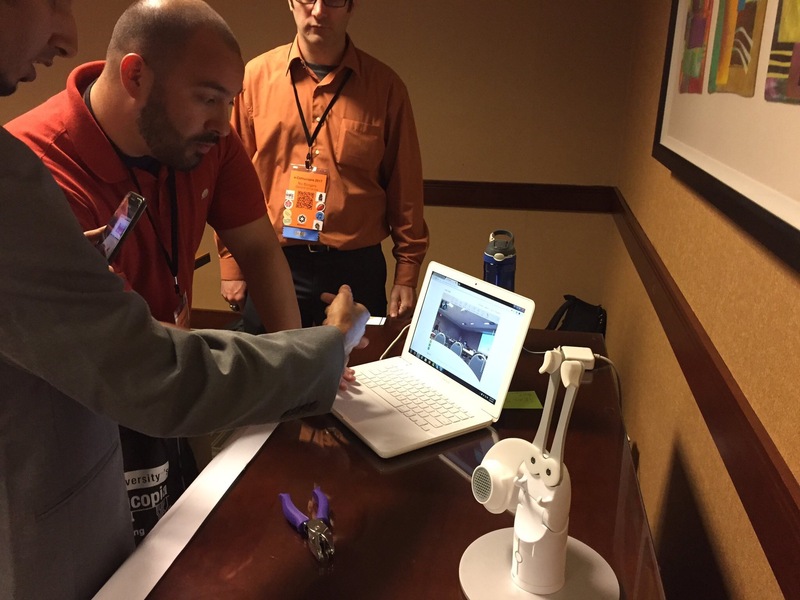 Thinglink – Using to delivery media-rich activities and course content. Youtube – Access to a world of ed content. Creating engaging faculty professional development is always challenging. 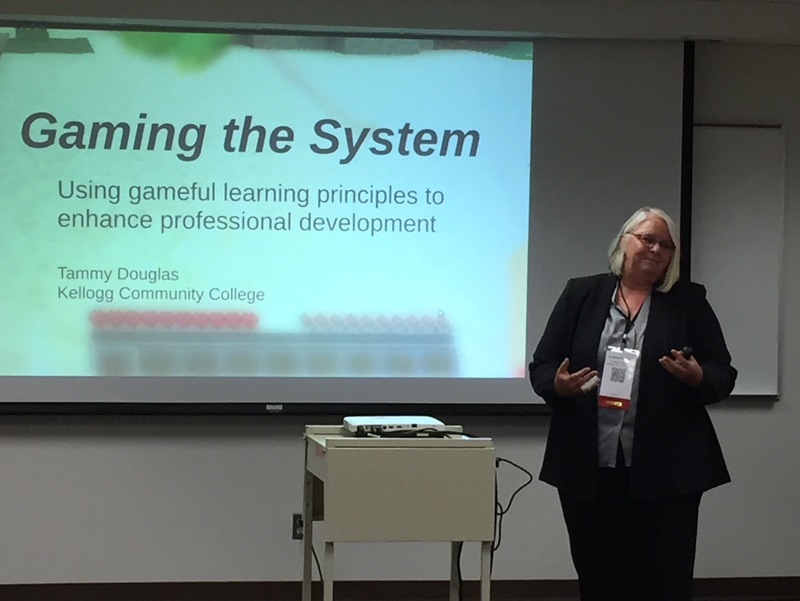 Kellogg Community College re-designed a required Instructional Design course for faculty using gameful learning principles to motivate and engage faculty in innovative professional development. Tammy Douglas – Tammy Douglas is Director of Learning Technologies at Kellogg Community College, where she oversees distance education and chairs the Online Course Development Committee. It all started with this faculty contract… faculty are required to take: 1) online teaching and learning and 2) instructional design class. Design by committee… outline of topics, basic information, disconnected subject matter, committee disengaged. Culture eats strategy for breakfast lunch, and dinner… the best plans don’t get executed if its not supported. Talk to faculty about what is needed in the classroom, eg. classroom management, learning objectives, assessments, etc. Redesign > Model the technologies, teach the unwanted content, bite sized pieces, reveal the mysteries of the design process, provide the tools and support. Gameful learning, ed psychology, motivational theories, engagement techniques are key. ID course is delivered in campus LMS, includes the basics but also student profiles – to check assumptions about students in the roster. The Instructional Design Basics class is delivered as a hybrid with a variety of levels. The first step in any learning endeavor is engagement. If your students are not engaged, learning is not possible. Gameful Learning is a practical pedagogical approach that you can use to enhance learner engagement. 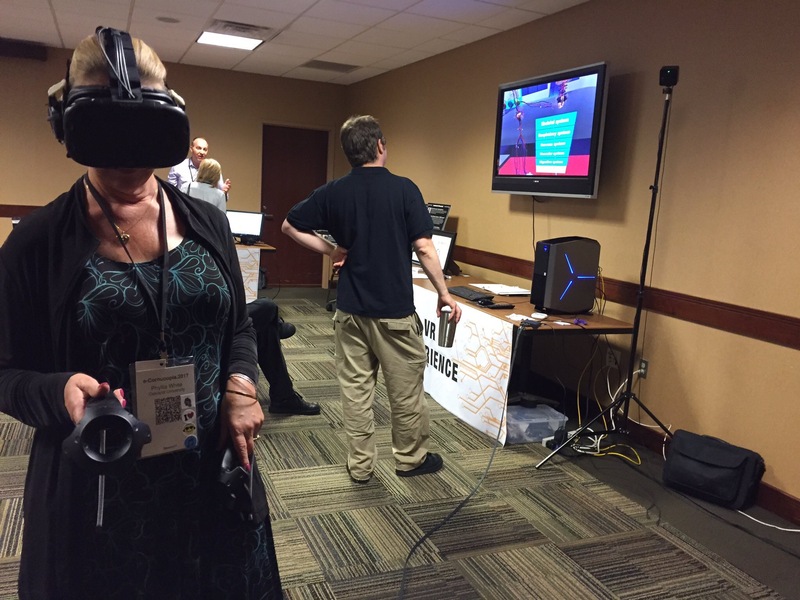 Being gameful means leveraging our best knowledge about student motivation, and is closely tied to cutting edge ideas such as personalized learning, outcomes-based and standards-based learning, and digital credentials. 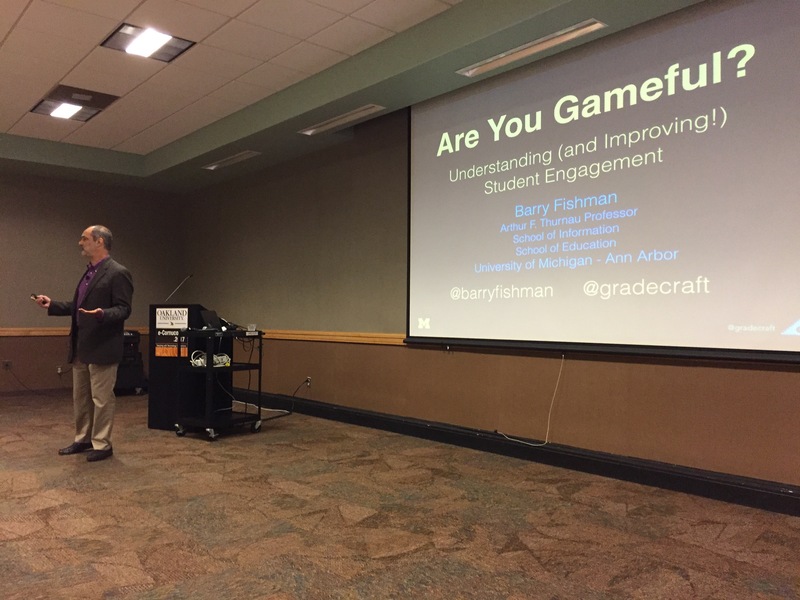 This talk introduces core concepts for making education more gameful, and a tool called GradeCraft designed to support gameful teaching. It’s not about the technology it’s about the what and the why. The key challenge about what we do as educators is touch and commitment, and focus and support – as it’s difficult! It’s not about the games for learning (eg. 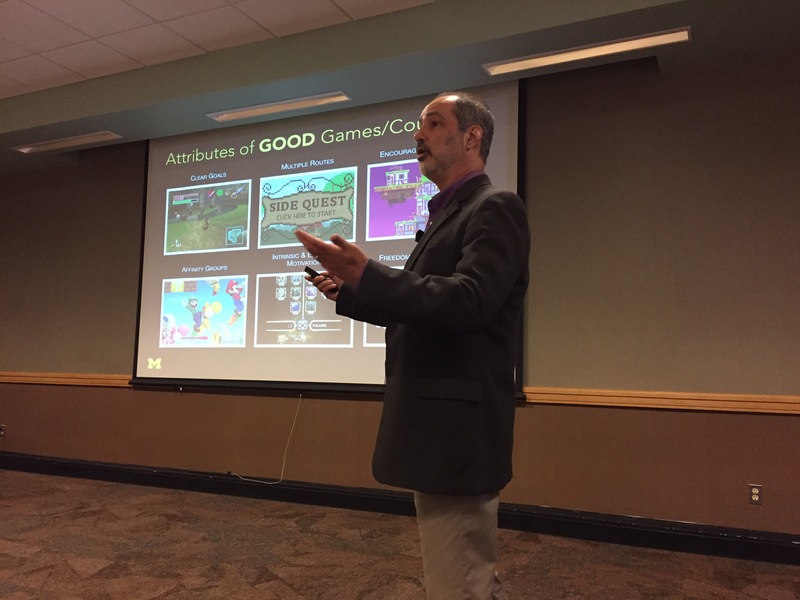 brainpop.com), gamification of learning (classdojo – gaming techniques for the classroom,), ludic learning (take an environment and make it a big game “classcraft”), “gameful learning” is the focus of the keynote. Challenge we face: deeply engaged, take challenges, risks, resilient… BUT school is a game but it’s a “terrible” game. Well-designed games: engage players early and keep them, appeal to curiousity, encourage to take risks… people play well-designed games because they are challenging. Can we develop an environment that promotes engaging challenges? 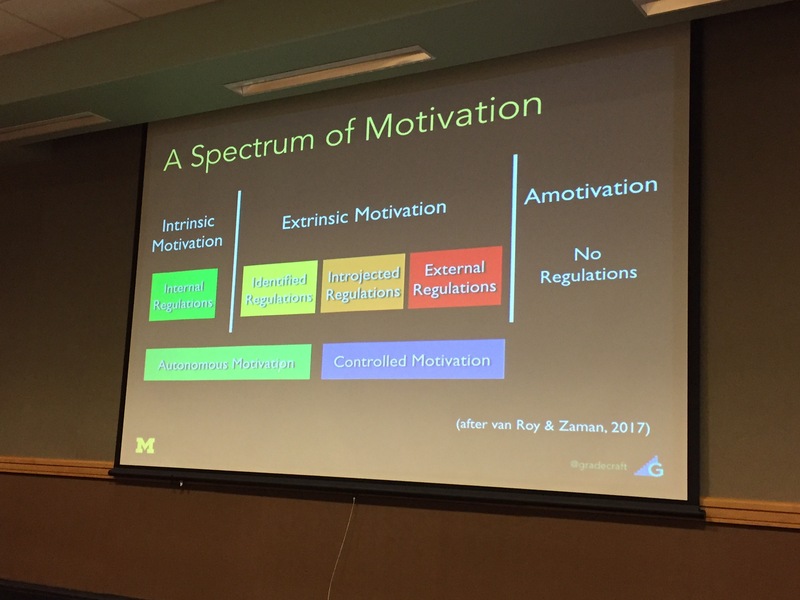 Intrinsic and Extrinsic Motivation – What pushes or pulls individuals to start, sustain, and finally complete activities > focuses attention. Extrinsic rooted in rewards, intrinsic in about emotion/feelings. Support Automony – Keep on learning and loving it… wants to enhance career… it’s best to have motivation based on autonomous because when external variables are removed. 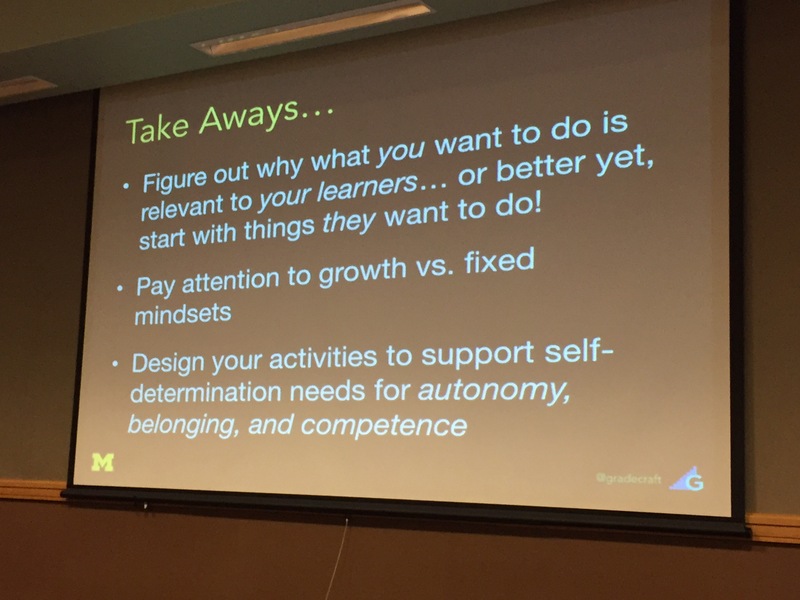 Ability or Effort – (Carol Dweck) fixed mindset or entity learners vs growth mindset or incremental learners… if you work hard at it you will get better at it! 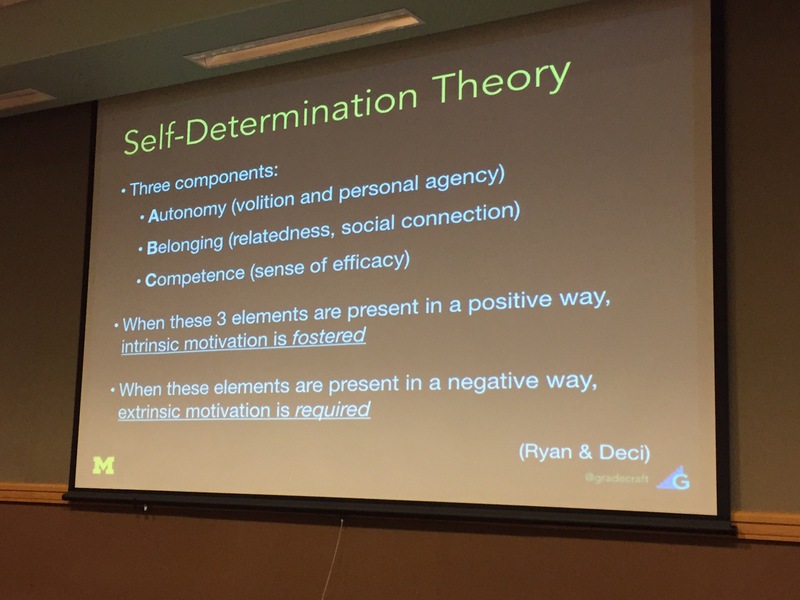 Self-determination theory – automony, belonging, competence… when these are position in a positive way intrinsic motivation is fostered. When they’re elements are present in a negative way, extrinsic motivation is required. 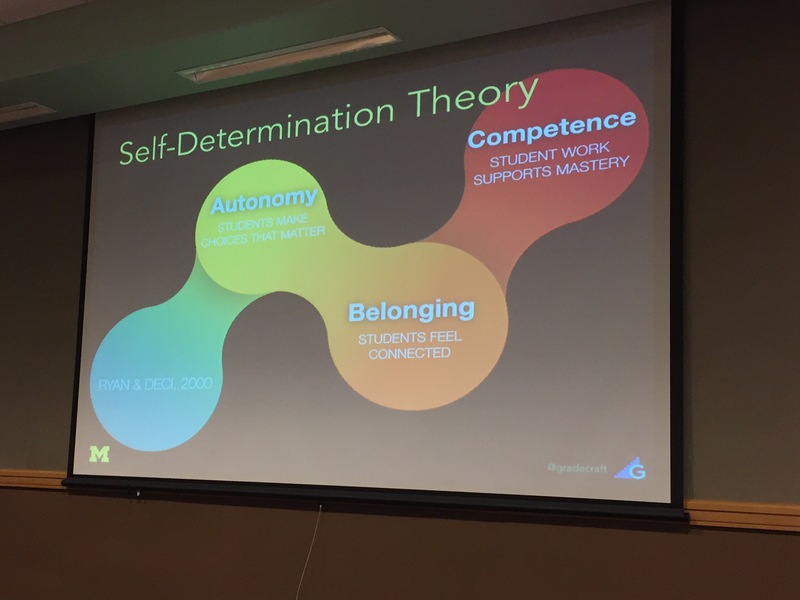 Belonging – desire to interact with, be connected to, and expiring caring for/by others, is about developing secure and satisfying connections in ones social surroundings, we need to experience a sense of belonging and attachment. Competence – understanding how you can active/attain the outcomes you desire, you have control, being able to perform the actions necessary. 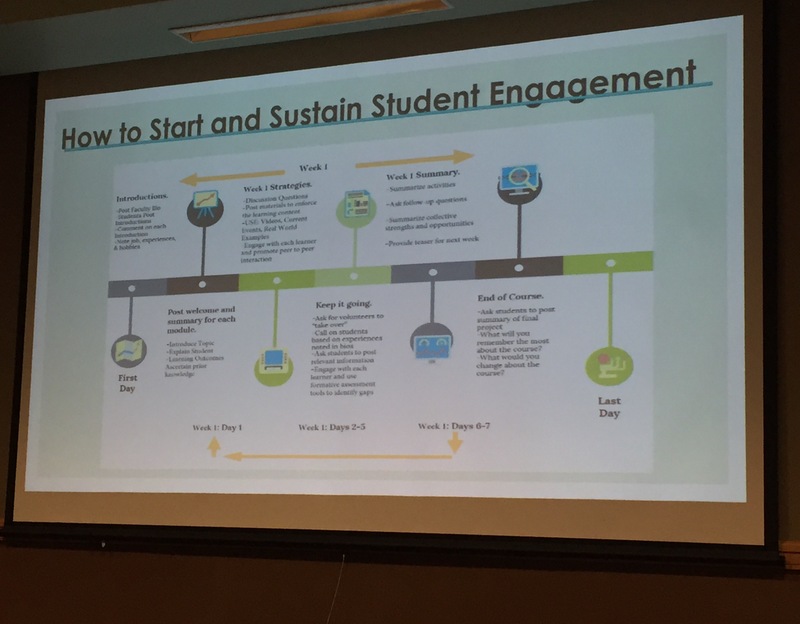 Session 5 – How Do We Promote and Sustain Student Engagement? Participants in this session will explore the process of creating a comprehensive student engagement plan that can be applied in online education including asynchronous, hybrid and face-to-face classrooms. Participants will learn how to start and sustain student engagement throughout the course. Various technological tools and pedagogical methods will be used to enhance the participant’s mastery of promoting and fostering engaged learning environment. 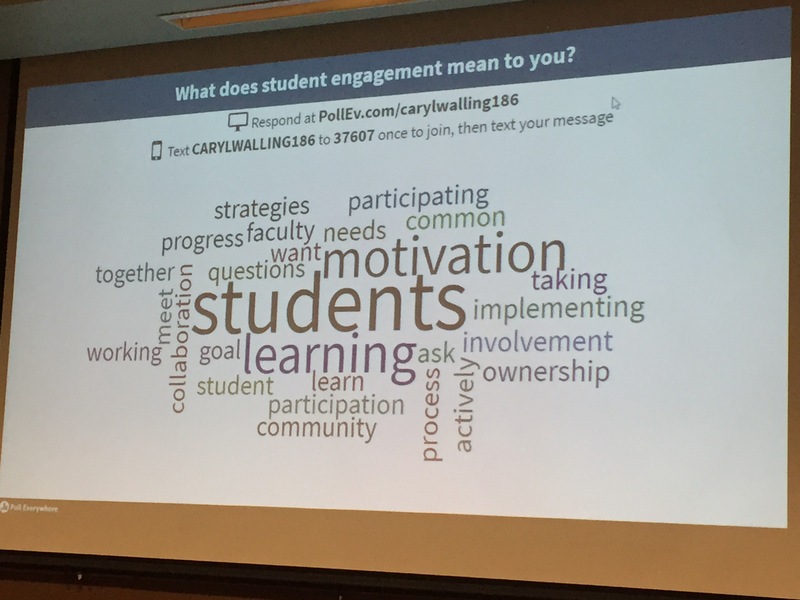 What does student engagement mean to you? GVSU will be celebrating National Distance Learning Week (NDLW) from November 9-13, 2015 to recognize the continued growth and value of online and hybrid learning at the university. NDLW is organized by the United States Distance Learning Association (USDLA) and serves to highlight the successes and value of distance education. To celebrate and to recognize faculty at Grand Valley State University, IDeL in the eLearning and Emerging Technologies group, and the Pew Faculty Teaching and Learning Center (FTLC) have organized a breakfast on November 13, 2015! 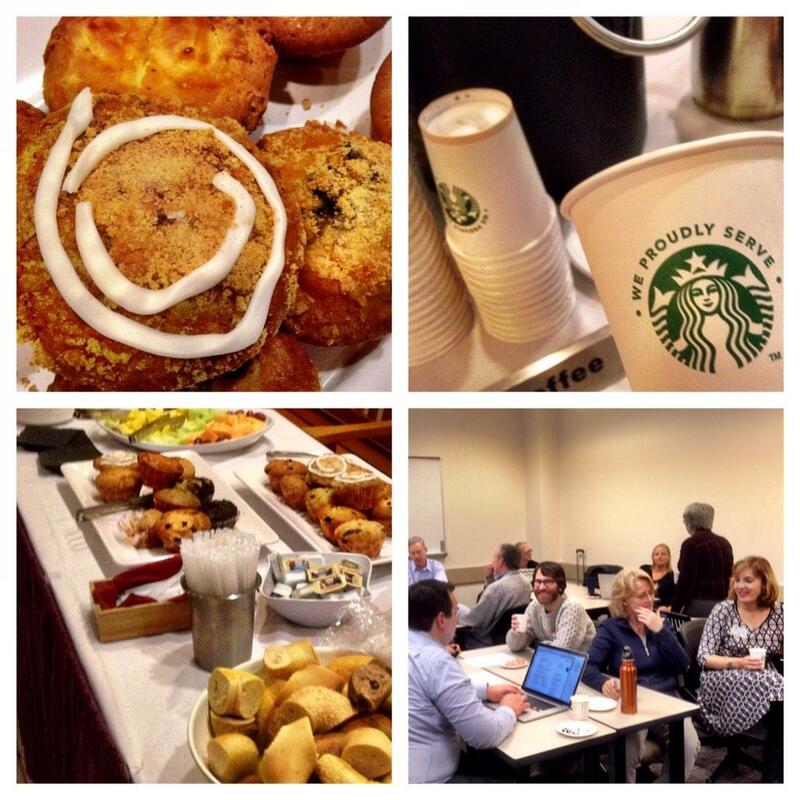 THANK YOU GVSU FACULTY – PLEASE JOIN US FOR BREAKFAST! We know how much work it takes to develop and teach quality online/hybrid courses and we appreciate the work of the faculty here at GVSU. Join us and allow us to treat you to a light breakfast in honor of National Distance Learning Week! WHY: For an informal meet, greet, and eat. This event is by the staff of IDeL (Instructional Design for eLearning) and the Pew Faculty Teaching & Learning Center. Grand Valley State University offers a wide array of courses and degree programs in the online and hybrid format with over 150 courses and just over 3,500 total student enrollments in distance education courses as of the Fall semester 2015. This represents a 91% increase in enrollment since 2011 with 12% of students at GVSU taking at least 1 online/hybrid course. Online and hybrid learning is an important flexible learning option at the university. In addition, over 500 faculty have been certified to teach online/hybrid courses through the Foundations course that is offered through IDeL and the FTLC. Strategic Priority 3: Ensure the alignment of institutional structures and functions. 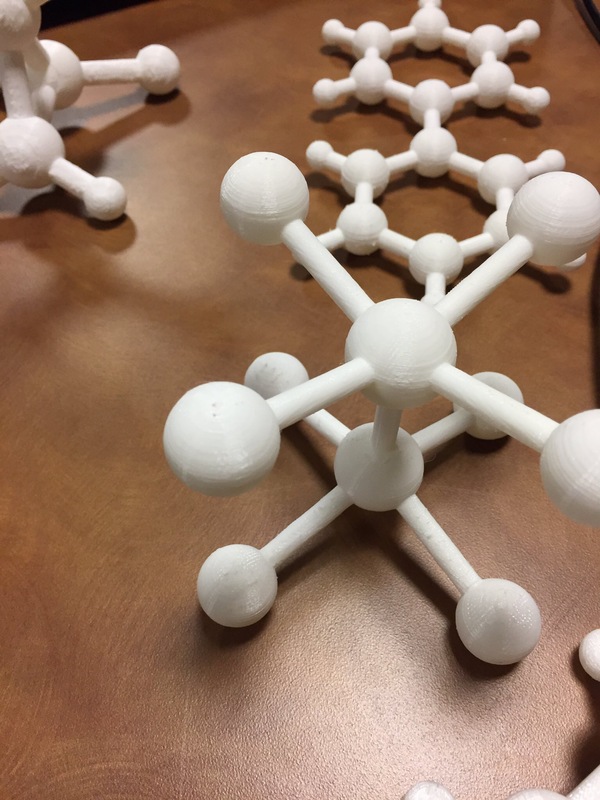 Institutional outcome D: Grand Valley supports innovative teaching, learning, integrative scholarly and creative activity, and the use of new technologies. Objective 3.D.2: At least 30% of undergraduate courses are offered in innovative approaches and formats, such as hybrid, online and competency-oriented. Baseline for undergraduate courses for Fall 2014 is 6%. Objective 3.D.3: At least 30% of graduate courses are offered in innovative approaches and such as hybrid, online and competency-oriented. Baseline for graduate courses for Fall 2014 is 25%. If you are interested in learning more, check out the eLearning and Emerging Technologies and IDeL websites along with the online/hybrid education faculty resources site at GVSU. 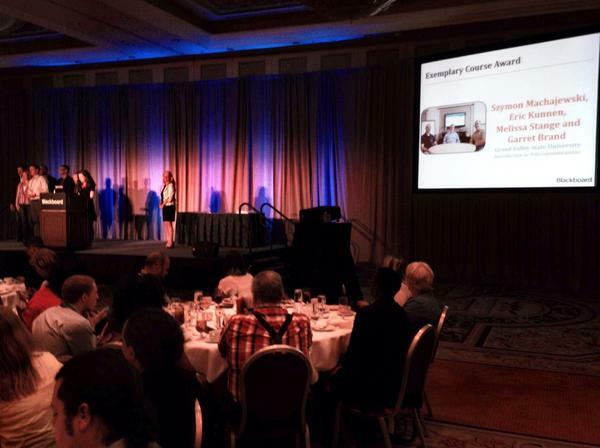 Design and Organization Tips from GVSU’s Blackboard Exemplary Course Award Winners! The IDeL team held a special seminar session to highlight 2 faculty members that have been awarded the Blackboard Exemplary Course Award for their course design. This session was also offered for the College of Education’s “Big Byte”. Professors Machajewski and VanderMolen were highlighted in a special recognition luncheon at the national BbWorld conference in Las Vegas, Nevada in 2014. 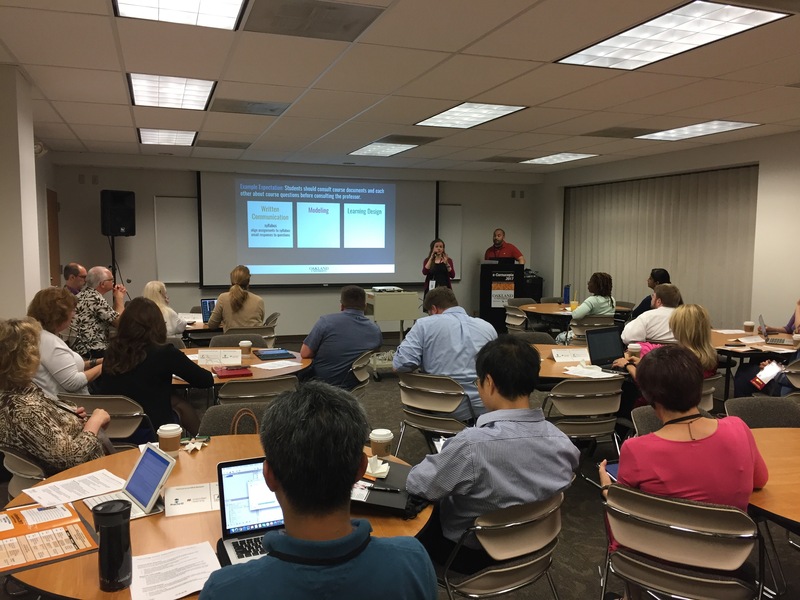 The “Design & Organization Tips from GVSU’s Blackboard Exemplary Course Winners” session was delivered by Affiliate Instructor in the School of Computing and Information Systems, Szymon Machajewski and Julia VanderMolen, Assistant Professor in Allied Health. These faculty received their award for their recognition of course quality in the design of their courses. The award in 2014 recognized 67 other winners from 43 institutions from around the world. Clear communication with students of what is happening now and what is coming up and when things are do. Chunking content within items and folders and replicating certain blocks of content can help students keep track of the most important information. Numbering sequences are also helpful in the content (1, 1.1, 1.2, 1.3, etc.) to match the sections in the gradebook. Links within the course to help documents for students provide timely assistance. For example, linking to the student help area on help.blackboard.com to provide information about how to submit their assignment. Quick links in the navigation panel such as “Send Email” is helpful because it is easy then for students to contact the instructor with the subject of the email indicating the section that the student is enrolled in. In the gradebook changing the total to “Projected Grade” helps student to understand where they are in the course at any given time. A “Final Grade” column is set up to show students their non-cumulative grade to help them get a better view of their progress. Using colors in the gradebook provides quick and at-a-glance views of the students that may not be performing as desired. Using a magenta color for flagging cells of higher than 100% provides the instructor with a quick way to check their work for accuracy in grading. That is, to catch errors in input. Providing multiple file formats to support universal design and access to content helps students with their ability to review the content from whatever computer or mobile device they are using. Szymon uses achievements and openbadges for students so they can export these to Mozilla Backpack. Here are some videos about using badges through openbadges. Badges can be linked to outcomes and provide an element of incentive for students (think gamification) and then also take these achievements with them after they graduate in their Mozilla Backpack. Julia uses screencast-o-matic (like Techsmith Relay) for weekly introductory videos which are part of weekly modules. Each week has a task and agenda. There are 3 opportunities to see and hear what is due in the week. In the course syllabus, there are also reminders of what is due and when. There is a check list of what tasks need to be done. Each week there are learning outcomes that are clearly identified to students which helps them zero in on what is due and where to focus. Using Blackboard IM and Collaborate tutorials are provided to students to help them connect to live sessions. Julia embeds the Google calendar in Blackboard so students can easily add the event to their calendar because all students at GVSU have access to Google. Consistency is key with same font and good colors. Due dates are also important to use because it helps students organize and prioritize their work across multiple classes. Using the discussion board helps to build community through a “getting to know you” opportunity. Interested in learning more? Check out the resources on the Blackboard Exemplary Course Program website. eLearning and Emerging Technologies through the work of IDeL (Instructional Design for eLearning) and in partnership with the Pew Faculty Teaching & Learning Center have a unique opportunity for faculty at GVSU. The “Online and Hybrid Teaching Circles” are designed for faculty to meet and to collaborate together to enhance online and hybrid teaching and learning. Kim Kenward, instructional designer in IDeL, helps to coordinate and lead these circles. 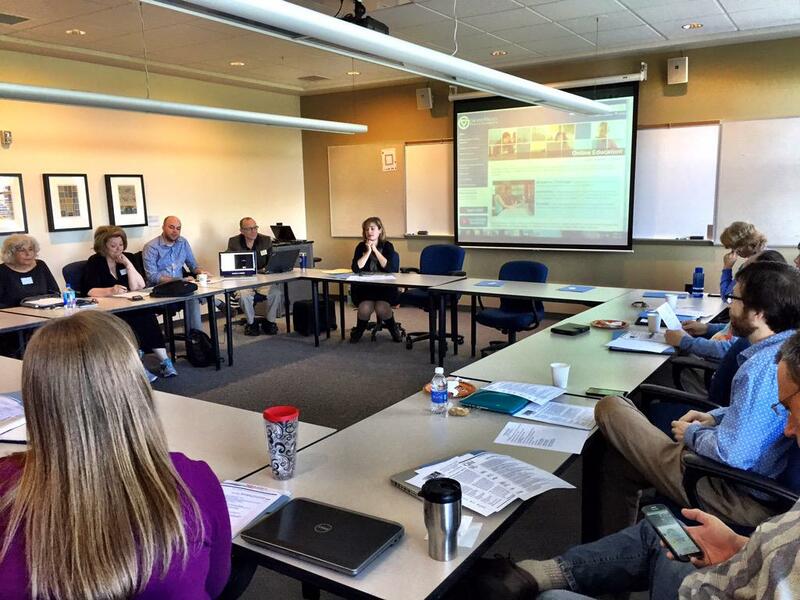 This is the second year that a teaching circle dedicated to online and hybrid instruction has been offered at GVSU. IDeL Instructional Designer, Kim Kenward, facilitating the Online & Hybrid Teaching Circle on Thursday, October 1st, 2015. It’s not about the technology… it’s about the when and the why around leveraging #EdTech to promote student engagement, enhance the quality of instruction, explore a variety assessments and feedback strategies, and finally to improve student success. This year, there are 3 Teaching Circles meeting at CHS, DeVos, and the Allendale campuses. about enhancing online and hybrid courses at the university! Session Description: Creating wider access to education, new markets for content, and expanded revenue opportunities for institutions, online education has rapidly gained a firm foothold in higher education globally. Several institutions are exploring how delivering exceptional online learning could be a key differentiator. ECAR, the EDUCAUSE Center for Analysis and Research, has recently released a report (“The State of E-Learning in Higher Education: An Eye toward Growth and Increased Access“) that focuses on “e-learning” aka “online learning”. The report highlights the grown of online learning along with some of the challenges. The recommendations (see below) included in this report [PDF] are important for strategic planning and can be extremely helpful as practical examples moving forward. “Nearly all institutions have a major interest in e-learning, at least at the level of some departments. Online courses are ubiquitous, with over 80% of institutions offering at least several courses online and more than half offering a significant number of courses online. Two-year (AA) institutions have historically been leaders in using distance courses to attract nontraditional students, and these institutions continue to pave the way in online course offerings to attract “post-traditional learners.” Among all Carnegie classes, AA institutions are most likely to have a center dedicated to e-learning and are most likely to offer a significant number of online courses. For successful, large-scale implementation of e-learning, a centralized model provides more efficiency and seamless integration of e-learning services and is characteristic of more mature institutions. However, for some institutions, a distributed model allows for more innovation and individualization for specific programs. There is a desire to more than double the number of e-learning staff in central IT. The most-desired positions include course designers, professional development staff, and app designers. IT is involved in the management of e-learning services in almost two-thirds of institutions. What are some of the key recommendations in the report [PDF]? Make e-learning initiatives part of the institution’s strategic plan and budget. Faculty development programs should be coupled with technologies that are deployed and provide the infrastructure for online learning. Develop e-learning incentives for faculty to nurture faculty interest in teaching with technology. Designate an office or center to manage, coordinate, and administer the necessary services along with assist in providing the management and vision for online learning. Develop a strategy to support students and their needs. From online readiness to technical support to help to ensure student success and retention. Consider partnering with content providers (open education resources), technology vendors, and support services to provide a comprehensive online program. Make course design support flexible and responsive to faculty needs. 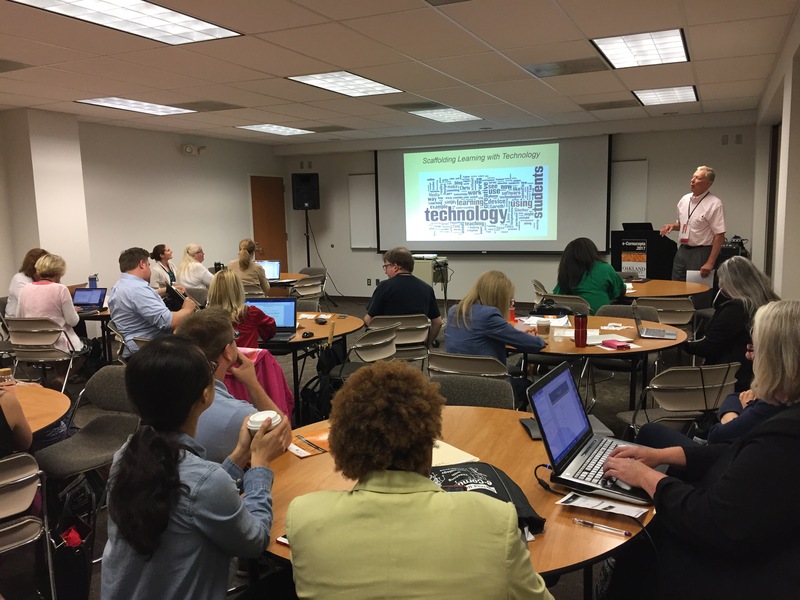 Ensure that the technology is easy to use and that faculty are aware of where to receive support and what technologies are available to them to help shape their instructional design and pedagogical application of technology in teaching. Is there enough staffing to support the growth and professional development needs? Consider increasing the number of staff to support e-learning initiatives. Training, instructional design, quality, and student support require people who have the pulse of what is needed and can assist in a timely manner. E-Learning technologies should focus on ease of use, integration, reliability and effectiveness. The technology should provide the needed resources for faculty (course delivery, retention, communication, grading, and efficient/effective tools to teach), students (social learning and personal learning networks and management), and the administration (reporting, big data, analysis, student success/retention). How does your institution score on the progress in E-Learning? Take the ECAR E-Learning Maturity Index Assessment to find out! 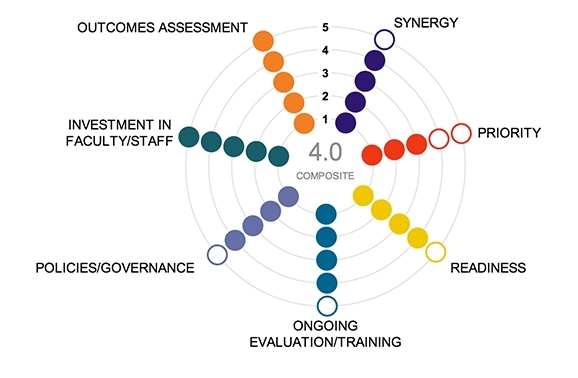 This assessment covers areas such as: Priority, Readiness, Ongoing Evaluation/Training, Policies/Governance, Investment in Faculty/Staff, Outcomes Assessment, and Synergy.